1. For the women’s glasses, attach the ribbon and tulle to the bottom with a glue gun to create the same look as a dress. You can scrunch up the tulle for extra volume. For the bridesmaids, use pink. For the bride, use white. 2. Add rhinestones and any other embellishments you would like to complete the look. 3. For the men’s glasses, attach a matching bow to their ladies (so in this case, add a white bow to the Groom’s glass, and a pink bow to the Groomsmen’s glasses). 4. Add any embellishments you would like! 5. Voila! 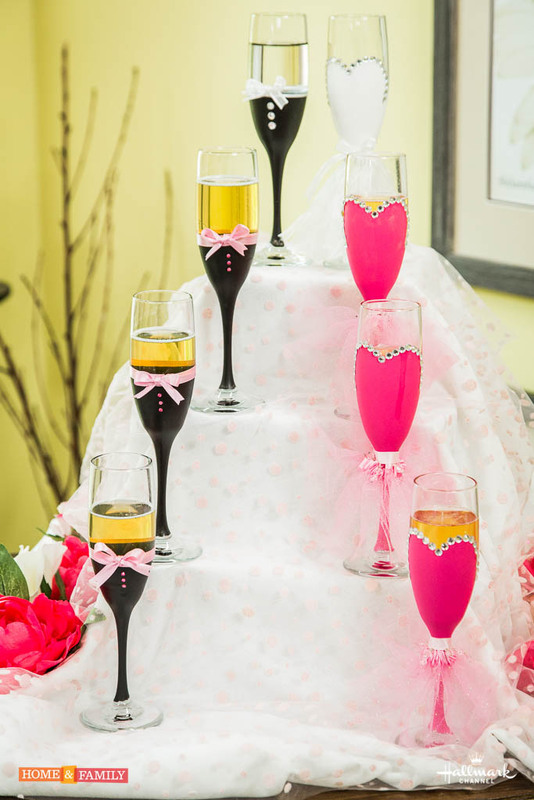 Raise a toast to your cute new bridal party champagne flutes! Missed the episode? Check it out here on Home & Family!